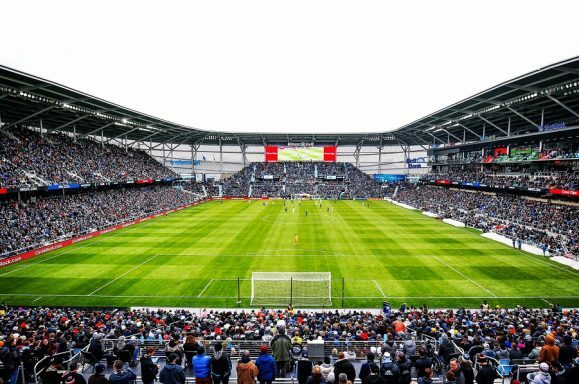 I’ll have a normal Matchday post out on Monday with some thoughts on Saturday’s incredible and infuriating Allianz Field opener and Minnesota United draw. But I wanted to test the patience of our readers, gaze deep into my navel, and write briefly about myself. I don’t have as long a history of Minnesota soccer fandom as folks who carried the torch for the team when the days were darkest. Nor those who led the way for the sport’s modern era when there was no guarantee that anyone else would follow. I jumped on the bandwagon when the club was rebranded in 2013. It is a historical anomaly that in my time as a fan of Minnesota soccer, I have only known growth and success. One thing I have loved about the Minnesota soccer community is that my tenure as a fan has never mattered to anybody. Soccer in America has always been the rare niche culture that strives, not to stay exclusive, but to become massively popular. Nobody asked my friends and I for our credentials when we stood with the Dark Clouds for the first time. We were passed the hot nuts and flags like anyone else, and people were genuinely glad to see new faces. But the added presence of my friends and I aside, it remained a plain fact that Minnesota soccer was an extremely scarce scene. In those couple years I gained a keen appreciation for the difference between three thousand people and four thousand. I was thrilled whenever a postgame write-up from Jon Marthaler made it into the Star Tribune with a photograph, or when Eric Perkins would indulge us with the occasional bit on KARE-11. When I interned with the team for a better part of a year between 2013-14, folks like Andrea Yoch and Eric Durkee were constantly hunting down scraps of publicity like this. It was an exercise in getting out the word almost person by person, trusting—just like so many of the supporters who laid the groundwork well before I ever paid any attention—that there was enough of a spark that it would all one day catch fire. Of all the infectious things about the soccer fandom of that time, I caught a belief in bigger and brighter days ahead. It’s why, after my internship was over, I ended up throwing myself into writing about the team. I joined onto Bill and Chris‘ blog The Loon Call, where I assigned myself the task of writing weekly NASL Power Rankings. Nobody paid us and just a couple hundred people ever read us, but I did it because I wanted to read a weekly NASL Power Ranking and I didn’t expect anyone else to put one together. I kept at it for two and a half years, during which the league ended up setting itself on fire and squandering any legitimacy I might have hoped to confer upon it with my coverage. In that period, we moved to the MinnCentric family and created NorthernPitch along with some of the people who had been covering Minnesota the longest, like Bruce, Wes and Brian. We built a larger following and covered much of the Loons’ MLS entry process better than the big established news organizations, simply because were the ones who cared most to do it. Even in the opening year or two of MLS, when we opened the website that you are reading, I still felt the same fervor of the evangelist that pushed me to spend hours of my life weighing the relative strengths of the San Antonio Scorpions versus the Carolina RailHawks. That pushed me to start the Matchday columns that I write now, because I wanted to read some kind of dedicated tactical analysis of the Loons and I didn’t expect anyone else to put it together, and for some reason I believed that mattered. I still think it’s fun to think and write about Minnesota soccer, but things are different now, aren’t they? For one, this site’s alumni are everywhere: Jeff Rueter is putting out tremendous weekly coverage for The Athletic, Kyle Eliason is working with the great team at ProSoccerUSA, and Matt Privratsky is helping to put Minnesota women’s soccer in the spotlight with EqualTimeSoccer. Then there are the (no longer just) Two United Fans, who have been evolving with a really unique concept for so long that I can’t remember when they started, The Daves I Know, who faithfully embody the raging id of the fanbase, the folks at E Pluribus Loonum, who have a better Twitter game than I do, the good people at Zone Coverage, and many more. This team has great coverage in the Star Tribune from Jerry Zgoda (and before him, Meg Ryan), and in the Pioneer Press from the tireless Andy Greder. Minnesota United are one of the best covered teams in the entire universe of American and Canadian soccer. This week, all I wanted was to read about Allianz Field, and it was incredibly easy to do that. Just about everyone has remarked on how the new stadium in Midway represents a kind of permanence and relevance that Minnesota soccer has never had. For me, that permanence comes with a genuine sense of relief. For six years I have felt a pressure to do my part and help push this team forward, whether from within or without. What this team lacked in attention and coverage, I felt as though I could provide, and that I then had a responsibility to do it. This sense of responsibility was entirely self-inflicted and self-centered, but I have a strong suspicion that I have not been alone in feeling it. Countless people put in so much effort over the years for so much less reward. People saw the need for tifo and they worked to make it happen. People saw the need for supporters charity work and they made it happen. People saw the need for things like capos and they made it happen in the right way. These tasks were exhausting, largely thankless, witnessed by mere handfuls of people, and almost entirely uncompensated, but people believed in this thing, whatever it was, and willed it to succeed, each in the small way we believed would matter. On Saturday, this vast, byzantine, hopeless conspiracy of Minnesota soccer broke into the open. It took the form of concrete, steel, and ethylene tetrafluoroethylene. Tens of thousands of people—where did they come from—attended to it. They sung the songs that were first conceived by dozens on metal bleachers, and raised a giant tifo that honored the legacies of the teams and fans that came even before the modern era of the Thunder, Stars, and United. Who were the people who wrote about the Kicks, who organized their friends to support the Strikers, who believed that the permanence of Minnesota soccer was just around the corner? The vast amount of the credit for what happened on Saturday belongs to people like Dr. Bill McGuire, Buzz Lagos, Manny Lagos, and Angie Blaker. But a share also belongs to all of us, and the future belongs almost entirely to an “us” that is bigger and more diverse and interesting and involved than I ever would’ve properly imagined. As I scrolled through Twitter, reading post after post about the game and seeing photo after photo of the stadium from people I didn’t know, and some people like mayors and legislators and lieutenant governors who I did, it was so incredibly obvious to me how insignificant what I write is now. That might sound like I’m asking for recognition or sympathy—the exact opposite is true. I don’t want to have a career as a soccer writer, I’m thrilled that I no longer feel any need to be one. This has a life of its own now. I could stop writing tomorrow and the entire enterprise would continue growing and expanding with no delay. That’s what so many people wanted to see for so long, and I and others caught the bug from them, and we passed it on to a few people, and they must have passed it on to still more, because now that thing that we all believed in has knocked down my old supermarket, relocated my old liquor store, and is, I think, at last unstoppable.